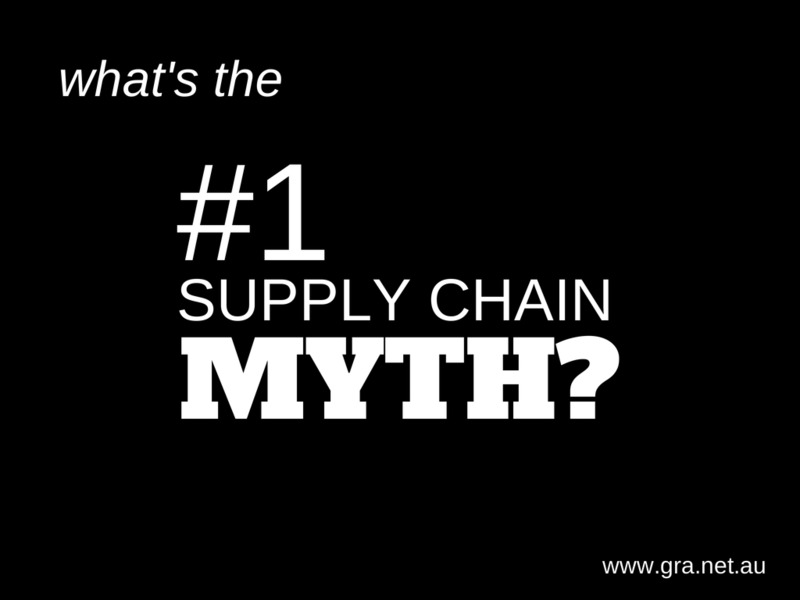 GRA Supply Chain Blog: What's the #1 Supply Chain Myth? What is the #1 Myth is Supply Chain Management? This misconception is the bane of many supply chain professionals’ lives. Despite surveys amongst the Supply Chain community referring to increased expectation to manage complexity, retain talent, improve value and manage risk, cost often remains the number one priority. The obsession with lower cost can restrict the evolution of supply chain performance in many organisations. Many of us continue to battle the consequences of this viewpoint. Consider this observation from a recent Supply Chain Management Review (SCMR May/June 2014): By focusing on costs, investment in many supply chains has been limited to such an extent that innovation and competitive advantage may be compromised. Traditionally, supply chains were based on assumptions of stability and consistency – and subsequently focused on maximising throughput and return on assets such as manufacturing facilities. In this context, a preoccupation with efficiency is understandable. Today’s business environment requires a broader approach, and this should flow from business strategy. This strategy – how you intend to compete and what your points of difference are – should segment customers and channels based on their needs and drive the configuration of your supply chain. These needs may be price, quality or service driven. The strategic planning process should match your supply chain capability against these needs whilst acknowledging that your organisation can’t be all things to all people. Developing your supply chain strategy this way will allow you to differentiate your organisation from your competitors’ and strengthen competitive advantage. The key to bringing strategy to life is a clear, objectively defined Customer Offer. This should define the ‘rules of engagement’ with your customers, establish what is required from the supply chain and, as such, allow the front end of your business to match the back end. Without this, your organisation will not be able to measure performance and understand your cost-to-serve, profitability and business sustainability. If your strategy is to offer high levels of service to certain segments, you need to determine what levels of costs are appropriate. These will be very different to the cost required to serve segments where price is more of a concern than service, and different again for segments that regard quality or customisation of greater value. In addition, the lack of a guiding customer offer can lead to other issues such as loss of revenue via customer dissatisfaction or inefficiencies such as over-servicing. Managing costs will always be of relevance to supply chains, but the question of costs should stem from a broader discussion of business strategy and customer needs rather than be the starting point. Instead of arbitrarily targeting lower costs, the question that needs to be asked is: what is the right cost for your supply chain? Running an efficient (or lean) supply chain is only one of several possible directions. Additionally, cost should never be the sole measure of success for a supply chain – KPIs and Metrics should reflect other strategic priorities. Focusing on more than just executing at the lowest cost will allow your supply chain to become a source of innovation, growth and opportunity. If you would like to receive news and updates from GRA, please sign up here. GRA regularly publish articles advising Supply Chain Professionals on how to improve their supply chain performance. If you would like to speak to GRA about your current Supply Chain challenges and opportunities, please call (03) 9421 4611 or contact us online.